Re-submit the entire event and then send a notice to the Camps, Cruises, Vacations Editor specifying which entry to delete. as all data are those of the submitting party. Events may also be submitted to the Mid-Atlantic DanceNews. (The 2018 Events list follows the 2019 Listings for research where the Organizers have not yet updated events for the 2018 Calendar). on a journey of spectacular beauty. Our 2019 Mediterranean ballroom dance cruise has it all � history, architecture, dancing, fun, culinary delights, great company, and our internationally acclaimed ballroom dance pros. gratuities, gourmet meals, alcoholic and other beverages, private cocktail reception and more. We can take care of all pre and post hotel arrangements, insurance, and flights. Private tours available for our group in Florence, Rome, Sorrento, and Corfu. with classes in diverse topics such as world affairs, wellness, art, wine appreciation, digital photography and iPad film making. Open to all students, amateurs and professionals. Four days of classes include Basics & Variations, Technique & Muscular Exercises, Styling & Artistic Impressions and more! This camp is not for Beginners. You must be proficient in at least the Bronze Level. so you may then incorporate these figures into advanced variations. United States Dance Congress is a registered trademark of the Heritage Foundation. Learn from one of the best coaches in the World. Limited spaces available! Privates too. Please contact us while availability remains! 7 day cruise on a once a year exclusive itinerary for the QM2. Our studio is hosting a week of dancing on the world renown Ballroom dancing cruise line Cunard. See the 4th of July fireworks from the Boston harbor and dance the night away! No need to fly, we provide transportation to and from our studio in Wilmington De. chance to perform your showcase routine right on the ship! Space is limited to 40 people + early sign up discounts/perks. Assistance with finding cabin shares available. Cruise with BlueBallroom on the Queen Mary 2! The studio is hosting a week of dancing on the world renown Ballroom dancing cruise line Cunard. See the 4th of July fireworks from the Boston harbor and dance the night away! No need to fly, we provide transportation to and from our studio in Wilmington De. We will have on board 4 professional dance host + our own group classes, private dance parties, cocktail party, and chance to perform your showcase routine right on the ship! Space is limited to 40 people + early sign up discounts/perks. Assistance with finding cabin shares available. IDBDC has sold out many years so Register NOW to secure your spot! Several workshop CHOICES every hour! Aboard the Queen Mary 2 with our award-winning and internationally acclaimed dance professionals. For fans of Strictly Come Dancing, Dancing With The Stars, and So You Think You Can Dance � all the latest craze in dance hosted television. Dancing nightly to live(!) music hosted by our professionals and the Cunard dance team. 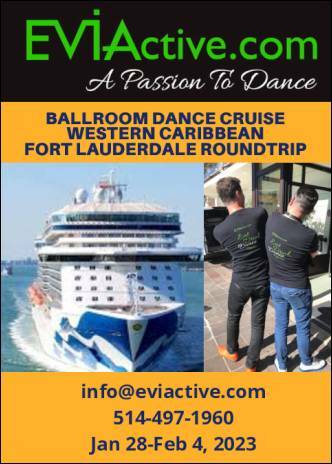 Group dance lessons hosted by Eviactive�s Passion to Dance team of professionals. boasting the largest ballroom at sea for us to whirl and twirl as we pass through spectacular natural beauty. Unlock the �Gateway to the Fjords� in Bergen, Norway, Enter Viking Villages. Cruise along the N�r�yfjord, a UNESCO World Heritage landscape. Competition organized by Igor Litvinov and Renata of Ballroom Hub,Social dance parties, Workshops, lessons, Gala Event with Showcases, and many surprises! Ole Burlay -10 time top teacher award in Canada and 6 time amateur champion in the Ukraine. Celebrate the traditions of Thanksgiving aboard The Crystal Symphony on a sun-drenched voyage through tropical isles. Join us as we dance our way through the Caribbean. From crystalline waters in Turks & Caicos to the coral reefs in Grand Cayman , and the quirky treasures in Key West we will dance and dine. Eat, drink, dance, repeat with Eviactive. Snorkel, dive, or swim in the Turks & Caicos, home to one of the world�s largest coral reefs. Ballroom dancers at sea on Crystal Cruises and our award-winning intentionally acclaimed dance professionals. 6 to 7 group lessons and private by request. 7 Night Cruise From Fort Lauderdale - Caribbean Visiting Grand Turk, San Juan, St. Thomas, Half Moon Cay, and More! on Holland America's Nieuw Amsterdam. 6 Afternoon Big Band Ballroom Dances, 4 To 6pm, In The Queen's Lounge with the 14-piece Royal Virginians Big Band. Must book through Ahoy Cruises to attend the dances and any private group events during the cruise. The following 2018 Events are listed for reference where Organizers may not have posted updated info for 2019. Use this Listing for Contact info and probable/approximate Event dates. Jan 20 - Jan 28, 2018 - Cruise to Beat the Winter Blues! Join our exclusive group cruise as we sail round-trip out of Ft. Lauderdale, Florida on the beautiful Crown Princess, and visit the gorgeous islands of Antigua, St. Maarten/St. Martin, St. Thomas, and the Dominican Republic! While this isn't a dance-only cruise, we will have exclusive swing and ballroom dance lessons just for our group, and find every dance event on board the ship (Princess has lots of dance options daily). If you live in the MD/DC/VA area, you definitely know our guest dance instructor - her feet just can't stop flying! In addition, group-only exclusive activities and amenities include a welcome cocktail party in Ft. Lauderdale the night before the cruise, gift bags, chocolate-covered strawberries, $25 on board credit per stateroom, group shore excursion options and other activities and surprises. Only 8 staterooms remain at our exclusive group prices (starting at $899 per person, double occupancy, for an interior cabin, plus taxes and fees). Movie Theater & Coordinated Shore Excursions (optional). We cordially invite you and your friends to join us during the week of April 7-15, 2018 as we escape the cold, wintry weather and head for sunny Caribbean. Sailing from Miami, this fantastic 8-day cruise travels to some of the most beautiful ports in Southern Caribbean. Enjoy this fun-in-the-sun vacation with us as it will provide a lifetime supply of fabulous memories as we discover the ABC Islands. Picture the magnificent cruise ship Equinox, a floating five-star hotel and one of the newest marvel of the Celebrity Cruise ships. It is big, it is bold with stunning multi-million dollar investment on its art pieces. Two outdoor pools, a spacious indoor pool, fabulous health spa, Dance Clubs, theaters, ship-wide casino, duty-free shopping mall, huge all-day dining room of delectable dishes, and specialty restaurants to satisfy different palates. There is no shortage of entertainment onboard Equinox � big production shows, comedians, magicians, music, and dance. At the Martini Bar, you might even see a spectacular show involving bottle-flipping, glass-stacking, and the pouring of dozens of drinks at once. During the day time, there are pool-side games and sports courts that regularly host basketball shoot-outs. Enrichment options include wine & spirits tasting, cake-decorating, sushi-making and other culinary demonstrations, as well as digital camera and computer seminars. But don�t let the comfort and excitement onboard keep you from going ashore. at the Hilton Washington DC/Rockville. Highlights: ◾OVER 170 Standard, Latin, Smooth & Rhythm workshops! ◾Several workshop CHOICES every hour! ◾Fireworks trip to Washington D.C. Sailing from Cape Liberty (Bayonne), New Jersey aboard Royal Caribbean's cruise ship Anthem of the Seas. 9 nights, five ports-of call; Boston Massachusetts, Portland and Bar Harbor in Maine, Halifax, Nova Scotia and Saint John, New Brunswick (Bay of Fundy). Latin dancing in Boleros, exciting dance parties in the Music Hall and our private dance parties. **Additional categories may be available and rates will increase once initial allotment of cabins is sold. **Deposit of $250 pp is due now to reserve your cabin. Enjoy one of the only Dancesport competitions to be done on a cruise ship. Join us on a trip of camaraderie & friendship filled with dancing & destinations that will "WOW" the imagination. intertwined with the intoxicating sense of wonder only travel & adventure can provide. 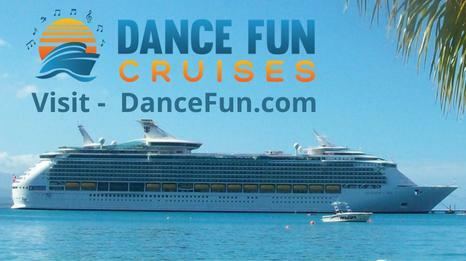 Contact us at www.DanceSportCruises.com or Dancesportcruises@gmail.com for more details. To celebrate Chevy Chase Ballroom's 50th anniversary! The trip includes attending Hawaii Star Ball. Welcome Luau, evening dance parties, exciting shows and dinner. Hawaii Star Ball will be a great dancing experience for competitors and social dancers. October 4, a night out "on the town" and celebrate CCB's 50th Anniversary. Don't wait, contact us now! This specially designed tour enables you to learn from top world-renown tango instructors during the tango festival in Zagreb, through intensive seminars & workshops. Dance at the nightly festival milongas with your fellow trip tangueros along with attendees that will come from all over the world. Admire tango professionals dance during exhibitions. Eat authentic Croatian cuisine. Tour and enjoy local hot-spots and city attractions and much more. With the expertise of Jacklyn and Roberto, you will feel the comfort of knowing that everything has been carefully crafted for a full-blown tango and cultural experience, so you can enjoy the companionship of other like-minded tango aficionados joining the tour and seeking a holiday adventure. Live music, dance parties, Dixieland jazz, and warm sunshine. Prices 60% lower than those advertised by the cruise line. At Latin Dance Adventures, we wanted to combine our two most favorite activities in the world: Dance and Travel. Latin Dance Adventures brings dance lovers together for a themed tour group experience. Ballroom Dance Camp for adults. There are ballroom dancing classes each day in American style foxtrot, waltz, swing, rumba,cha cha, etc. Luxury Ballroom Dance Cruise May 22-28, 2016 from Vancouver to San Francisco. Ballroom Dance Weekends, Ballroom Dance Cruises, & Ballroom Dance Destination Vacations. All Inclusive Events. Hosts Are Provided For Your Dancing Pleasure. Sixth Star is accepting applications for gentleman dance hosts onboard Cruise Lines. Tango Argentino, Salsa and Oriental Dance in Tuscany, Italy. 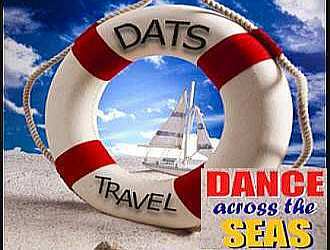 http://www.DanceAcrossTheSeas.com DebDoddCruises@aol.com Call: 800 827 7779 X888. A 3 Day intensive study program featuring World Class Dancers - underwritten by the World Dance Arts Foundation. Tango- and Salsa Workshops with internationally acknowledged teachers. Trips to Havana, Cuba, with a license from the U.S. Treasury Dept for educational and cultural purposes. West Coast, Lindy, ECS Workshops, competitions & dancing at Sea Crest Oceanfront Resort, Falmouth, MA. Dance Camps, Cruises, Workshops BUS TRIPS! Swing, Salsa, Country, & Ballroom Dancing! Ballroom Dancing on a memorable cruise, singles and couples. The only ALL-INCLUSIVE Dance Camp in the world. Air fare included. Over 60 classes to choose from. Big Band Celebration Cruises, with the Glenn Miller Orchestra and with other known Big Bands. A competition and exhibition for talented senior citizens. Destination information, maps & directories, weather forecast, international travel information, visa requirements. 24 hour reservatons service. Recurring Events Calendar || Special Events Calendar .